​​It’s nearing the end of 2017 and with that being noted, the last few months of this year has been EXTREMELY busy for SMG-Stockton. With multiple events in our various venues, we have been keeping our community entertained through the Holiday season. Here are a few highlights compiled to round out the year. The Stockton Heat Hockey team opened their third year at the Stockton Arena with a few additions to the #GetFiredUp culture. 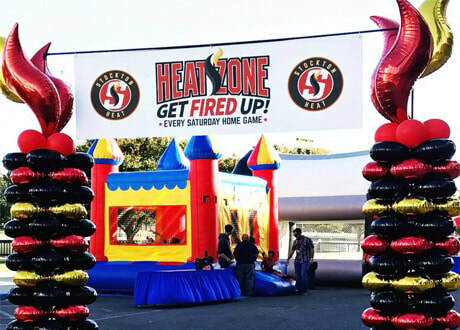 Heat Zone, which is a street party located outside of the Stockton Arena on Ring Road is a free to attend event that is open to the community two hours before each Saturday home game. Heat Zone features a jump house, slap shot, free face painting, spirit zone, games, food and live entertainment. In addition, Breakaway Café, the new social concept consisting of small bites from local restaurants and the newly installed Brewhaus is now located on the upper Fan Deck inside the arena for Friday and Saturday games. With different food promotions offered throughout the week, depending on the day, the Stockton Heat have really amped up incentives for the community. Teresa Caputo, famously known as the “Long Island Medium”, came to the Bob Hope Theatre in October. With her enticing reputation preceding her, there was no problem filling the theater for the event. With many members of the audience touched by her capabilities to reach to those who have passed on, the show itself was a huge success. Also in October, the premiere of Spooktacular Public Ice Skate happened inside the Stockton Arena. This Halloween themed event was a chance for the community to skate in the arena. Small children came dressed in their Halloween costumes and were treated to goodie bags for their participation. Children weren’t the only ones enjoying ice-time, however. Mothers, fathers, grandparents, and significant others were able to take the ice, no matter the level of skill. Alabama graced the Stockton Arena in November, with special guest Easton Corbin. With many in attendance, the concert was high in energy and sound as the crowd sang along to the classic hits of Alabama. Despite the rain, fans enjoyed a wine-garden style event located in the Bud Light Cold Zone, where they were able to enjoy a pre-show performance from Cottonwood Creek, a local husband/wife duo. A Fun & Festive Bright Night debuted at the Stockton Arena on December 2nd. With a similar concept as the Spooktacular Public Ice Skate, this event went above and beyond first-time expectations. Correlating with the Lighted Boat Parade on the Delta, the Stockton Arena was a one-stop shop for family fun and activities. Santa’s Playground was located outside of the arena, offering free fun with games, jolly jumpers, pictures with Santa Clause, and food and beverage available for purchase. Located inside the arena, two public ice skate sessions were available and a delicious dinner with a view of the parade was presented by the Record Press Club on the upper level. 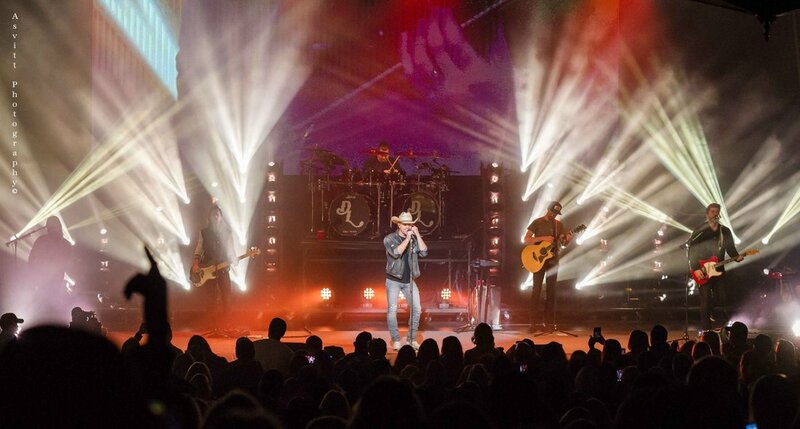 Dustin Lynch brought country music to the Bob Hope Theatre in December. On his first headlining tour, Dustin Lynch packed the house and had the crowd on their feet singing along to his hits and many others! Dustin brought the house down with his chart-topped songs and amazing performance. To follow holiday tradition, the Bob Hope Theatre had a couple of Christmas shows presented to the community. An Irish Christmas made their debut in the Theatre, bringing Irish dancing to a whole new light. Bruce Steivel’s The Nutcracker returned to the Bob Hope Theatre and brought ballet enthusiasts to their feet as they watched local students make their big stage debut. Stockton Ports One Week Left! 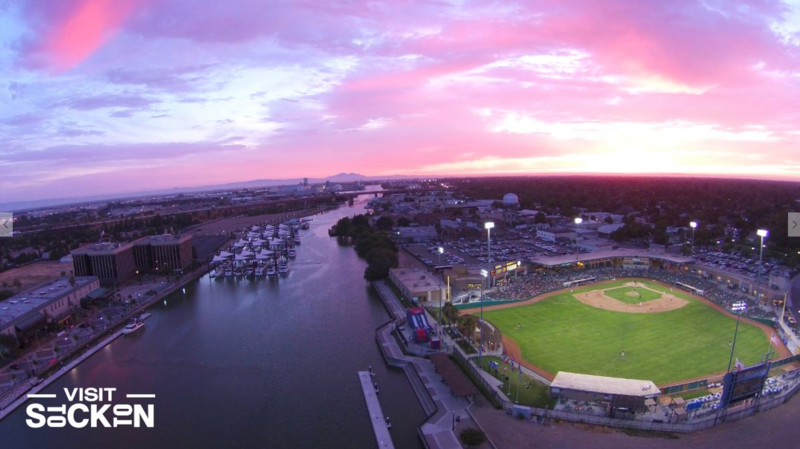 ​The Stockton Ports are down to their last week of the season! With an overall season record of 30-34, the Stockton Ports find themselves only 2 games back from tying the division. Excitement is rising of going to the playoffs and with a 7 game home-stand to close out the season along with a home record of 17-12, the 2 game deficit doesn’t look as big. ​With red hot team MVP and league RBI leader, Seth Brown, being 17 for his last 40 to go with 6 homeruns and 19 runs batted in, the team will face the division leading Visalia Rawhide two more games and then close out the season against the San Jose Giants. ​Come celebrate your Ports with hopes for a playoff trip and promotions each night starting with Thursday, August 31 “Dollar Beer Night” and cap giveaway to the first 500 fans. Also scheduled promotions include a Drawstring Backpack giveaway of first 1000 fans (September 1), Hometown Hero/Military appreciation night followed by fireworks (September 2), Disc golf giveaway for first 500 fans (September 3), and Fan Appreciation day followed by fireworks to close out the regular season (September 4). ​Join the Fun and let’s root the Ports to the playoffs! 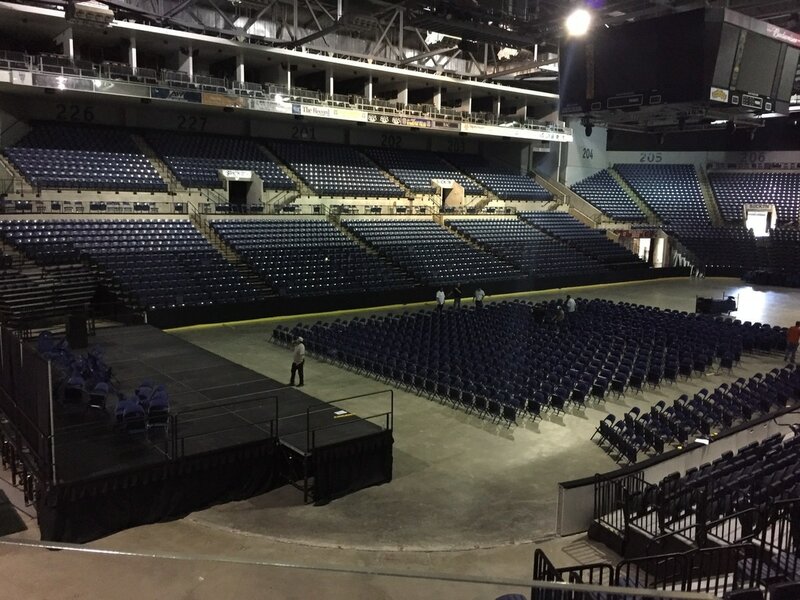 For the 5th year in a row, Stockton’s pop culture event StocktonCon returns to Stockton Arena. This year’s two day event will be jam packed with vendors, artists, and celebrities. Along with taking over the Stockton Arena, StocktonCon will also be utilizing the University Plaza Waterfront Hotel for different events throughout the weekend. The fun starts early this year, as StocktonCon takes over the Stockton Civic Theatre for APW wrestling on Friday night. Last year’s event saw over 15,000 people pass through the doors of the arena over the two day period. Comic books, action figures, graphic art, and so much more will be on display and available for purchase all around the Arena. Gaming events, panels, costume contests, cosplay, sword fighting demos and more fun activities will be happening throughout the weekend. Don’t miss your chance to meet the likes of Rey Mysterio (WWE, Lucha Underground), Ryan Hurst (Sons of Anarchy, Bates Motel), Walter Jones (Mighty Morphin Power Rangers), Ernie Reyes Jr. (Indiana Jones and the Kingdom of the Crystal Skull, The Librarians), Tracey Gold (Growing Pains), Scott Schwartz and Zack Ward (A Christmas Story), Alexis Cruz (Stargate), Tim Rose (Star Wars: Return of the Jedi, The Force Awakens), and many others. ​As WWE makes its way to the Stockton Arena on May 1st, many of the top superstars will be making an appearance. WWE live performs over 500 events a year and is so successful due to the popularity of all 150 superstars. The dynamic storylines that are combined with the physical element of WWE keep the fans intrigued from around the world. 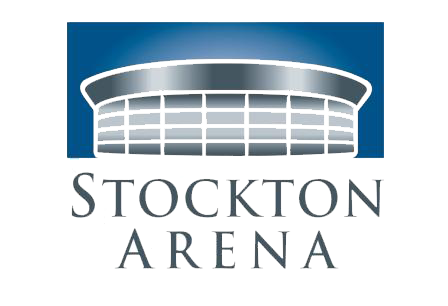 Headlining Stockton’s event will be the WWE Championship Match, the Smackdown Tag Team Championship Match and Smackdown Women’s Championship Match. The WWE champion Randy Orton, who will be going up against AJ Styles, will highlight the WWE Championship Match. Randy Orton has been around WWE since he was a child, having his father, uncle and grandfather all playing a role in the WWE world ahead of him. During his career Randy has taken the WWE and World Heavyweight Titles to be the first ever WWE World Heavyweight Champion. His rival, AJ Styles, has some phenomenal aerial maneuvers and extreme confidence. AJ Styles knows what is on the line for this match up and no one can deny his ability to win this championship. Team Uso looks to hold onto the tag team titles as they take on America Alpha for the Smackdown Tag Team Championship. The Usos are a team of Samoan decent having family in the WWE Hall of Fame as well as bloodline with “The Rock”. This group has been very wild and electrifying since capturing their first tag team title in 2014. American Alpha looks to grab their second championship title as they only entered the tag team realm in the summer of 2016. American Alpha will try to use their silky-smooth technique and explosive power to reach the top. ​The Stockton Heat are looking to extend their schedule and continue playing games all the way until June. Right now the Heat are sitting in fourth place which lands them in a playoff position in the Pacific Division as they continue playing some phenomenal hockey. Their playoff push all started back towards the end of February. Since then, the Stockton Heat have only lost two of their seventeen games in regulation. With such a outstanding streak going, in the last eight games, the Heat have gained at least one point to continue their push for the playoffs and have gone three points up on the Bakersfield Condors for the final Pacific Division spot. Through their past games, the Heat have had some noticeable records set or point streaks continued. Stockton Heat goalie, David Rittich, set a career high 47 saves during the game against the San Jose Barracuda. The Heat also continued their all-time long point streak of eight games during that game. With three games remaining on the Heats schedule, they are must wins if they plan on staying ahead of the Condors. All three of the Stockton Heat’s final games will be played at home in the Stockton Arena. The first game will be on Wednesday, April 12th against a playoff clinched Ontario Reign. April 14th is Military Appreciation Night as the Heat take on the Bakersfield Condors. The first 500 fans over the age of 13 will receive an Austin Carroll bobblehead. The next day, the Heat take on the Tucson Roadrunners; it is also Fan Appreciation Night and the first 500 fans will receive a Frankie the Firebird photo card. To start off the tournament, South Carolina put an end to Quinnipiac’s Cinderella story by handing them a 100-58 loss. This advanced South Carolina to the Elite Eight and one step closer to Dallas. For the second game, on Saturday, it was a show down between the regular season Pac-12 champions, Oregon State, and the cross-country ACC team of Florida State. In this match up, the lower seed Florida State prevailed. The game between South Carolina and Florida State was now set to see who would make their appearance in Texas and have a chance to be crowned national champions. South Carolina started the game strong and did not let Florida State come back. By halftime South Carolina had an 11-point lead, but with a few minutes remaining Florida State showed some drive and got the score within three points. The game ended with the final score being 71-64, and South Carolina is now headed to their second Final Four appearance in three seasons. The Rock & Worship Roadshow is one of Christian music’s most entertaining tours in the world. The Roadshow was formed in 2009 and has preformed over 200 shows and has reached over 1.4 million fans. In 2012, Pollstar named the tour to one of the Top 50 Tours of that year. The Stockton show will consist of Christian music favorites including Steven Curtis Chapman, Francesca Battistelli and Rend Collective. Steven is the most awarded Christian music artist of all time. He has won five Grammys, an American Music Award and has had over 45 No.1 singles in his career. He has also appeared on many TV shows including CNN, “60 Minutes”, E! Entertainment and The Today Show. Steven and his wife founded Show Hope in 2003, which is a non-profit organization that helps restore the hope of a family to orphans. Francesca started her music career at a young age; at the age of 15 she was already writing and preforming her own songs. Over the years Francesca has totaled four Grammy nominations, a billboard music nomination, 26 Dove Award nominations, and six No. 1 singles. Francesca is the face of female Christian Contemporary Music. The band Rend Collective has reach international audiences with its energetic style and music success. The groups first ever single was No. 12 on the National Christian Audience Chart. Since then they have reach No. 1 on the Billboard Christian Albums Chart and they have set new highs in the U.K. market for Christian bands. ​Don’t miss the chance to see these musicians and many more live at the Stockton Arena. This show can help bring families together through the powerful concert experience with some of the biggest artist in Christian music today. The show is on Thursday, March 9th at 7:00p.m. Tickets can be bought at the door.